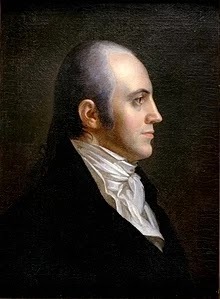 Since everyone is talking about impeaching Supreme Court Justices, let me tell you a story about how Aaron Burr saved America. In general Burr appears as a blackguard and scoundrel. And some of it is true (he did shoot Hamilton - but maybe it was an accident, who knows.) Burr's correspondence was lost, so there's a lot we don't know about him. Aaron Burr: Scoundrel, hero, or both? As VP, Burr presided over the Senate, which tries the impeached. In March 1803 the House impeached Judge Pickering, a federal district judge. Pickering was senile and needed to be removed. Burr conducted the Senate's proceedings admirably.Thomas Jefferson was intrigued by the possibilities. He had routed the Federalists in 1800 so the only real opposition was the Federalist dominated judiciary, and particularly his distant cousin Chief Justice John Marshall. Jefferson did not care for or trust Burr, but he mentioned the possibility of impeaching Supreme Court Justice Samuel Chase. There have been a fair number of federal judges impeached, but it was always linked to criminal activity. Removing Chase would have been a purely political move. On March 26, 1804 the House voted to impeach. On July 11, 1804 Burr shot Hamilton. Charged with crimes in New Jersey and New York, Burr fled to DC - where dueling was not illegal - and resumed his duties as Vice President. In early 1805, the Senate began its trial of Chase. Burr, by all accounts, presided in a fair, even-handed, and decorous manner. Chase was acquitted, by large margins on all charges on March 1, 1805. The failure to impeach Chase played a critical role in establishing an independent judiciary. Did Aaron Burr do this for the good of the nation? Or did he do it to get Jefferson, who had dropped him from the ticket in 1804. Who knows? He did the right thing at a crucial early moment in our nation's history.